Sleeping during pregnancy can be a challenge. Maybe you are anxious or worried about your baby and it keeps your mind spinning at night instead of sleeping. Maybe your hormones are raging so that you feel flustered or even just hot. Maybe you’re far along in your pregnancy so that you can’t get physically comfortable enough to sleep because of tender breasts or an aching back. Or maybe your baby is calm all day and then starts doing karate moves just about the time you are ready to go to sleep. In any case, insomnia during pregnancy is a very real, very normal problem that affects most pregnant women at some time or another. When you weren’t pregnant, you might have considered a sedative or sleeping pill, but that’s not a good idea as it can negatively impact your baby’s health. You need to sleep but you also want your baby to be healthy. Because your baby is taking all of the nutrients he needs from your body, you may be left with very little in the way of certain vitamins and minerals. Even when you take your prenatal vitamin supplements, you need to be sure that your diet contains enough of the right nutrients to take care of your own body as well as your baby’s. Vitamin B6 contributes to the production of serotonin (the “feel good” hormone) which eventually converts into melatonin (a sleep hormone). Foods rich in vitamin B6 include yeast extract, grains, dark green vegetables, bananas, and fish (such as salmon or tuna). Make sure that your diet is full of this vitamin so and you’ll give yourself more help in sleeping at night. Another nutritional substance that can affect your sleep is magnesium. People who are deficient in magnesium may struggle with insomnia. Talk with your midwife or doctor about supplementing your diet with between 200mg and 400mg of magnesium to help with sleep. (It can also help with constipation, detox, and other nutritional issues.) Here is one of the top selling magnesium supplements on Amazon, by Nature Made. Especially if your insomnia is caused by stress or anxiety, aromatherapy can be a great way to stop your thoughts from taking over and help you get to sleep. Chamomile, lavender, and ylang ylang essential oils are all effective in promoting a feeling of calm and soothing. Add a few drops of lavender to a tissue and lay it next to your pillow. 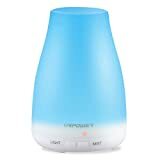 Use an essential oil diffuser (like this highly rated one on Amazon) for about 20 minutes (don’t use it all night or you could get a headache) before you fall asleep. You can also apply essential oils topically to your body. For instance, try adding a couple of drops of essential oil to a warm bath in the evening to help you and baby relax before falling asleep. For sore, tired muscles, dilute lavender essential oil with a carrier oil and rub onto your legs, feet, or aching back. This will help your muscles relax and also send the powerful lavender sedatives into your bloodstream to help you fall asleep faster and hopefully stay asleep throughout the night. Because blue light stimulates your brain, it should be turned off at least two hours prior to your bedtime. This includes laptops, smart phones, televisions, and tablets. Keeping any of these devices on works in the same way as sunlight, signaling to your brain that it’s time to be awake. Even the orange “nighttime” settings still cause your brain to be stimulated somewhat. Instead, turn on a soft lamp and read from an old-fashioned book. This will tell your brain that it’s time to produce melatonin, which is a relaxing hormone that promotes healthy sleep. Light stretching or yoga. Just prior to bedtime you can prepare your body for sleep with simple yoga or stretching poses. For example, lotus pose and child’s pose can help your body relax and become comfortable while you prepare your mind for bed. Breathing exercises. Release muscle tension and increase your oxygen levels with breathing exercises. This helps to reduce pregnancy swelling while calming your emotions and your mind. Focusing on the breath helps you to reduce anxious thoughts related to your baby or other life issues. Mindfulness and Meditation. Many apps are available today to help you refocus your mental energy and become calmer in your spirit. Guided imagery and prayer can effectively improve feelings of peace. Soothing music played in the background during meditation sessions may be helpful in promoting sleep. Progressive Relaxation. This type of therapy is a combination of mental and physical focus. It involves focusing on one muscle group at a time, flexing the muscles for a few moments and then releasing them to concentrate of the feeling of relaxation. This progresses through body groups throughout the body. At first you may need a guide (like this Progressive Relaxation audio CD on Amazon), but eventually you can do it on your own to promote sleep. You need lots of fluids when you are pregnant—but try to drink them early in the day! Frequent trips to the bathroom at night can interrupt your sleep. Early in your pregnancy you’ll have high progesterone levels and a growing uterus that make you have to go to the bathroom often. Later in pregnancy, your baby is pushing on your bladder as she drops further into your pelvis. If you can avoid drinking beverages in the evening, this should help you sleep better the whole night through. Periods of sleeplessness and fatigue can feel exhausting and even devastating when you are pregnant. However, they are not likely to be life threatening or dangerous to your health in the short term. Try not to get stressed out about your insomnia or it will only become worse! Stay calm, use these 5 Natural Remedies for Insomnia During Pregnancy, and talk to your doctor if it becomes too much to handle.